Today, April 22, is Earth Day: our annual reminder to take better care of our planet. But sadly, days like this tend to come and go with little more than brief recognition, and all the while our beautiful, delicate home continues to get sicker. Climate change is one of the most urgent problems Earth faces today, and it's not a far-off threat. It is real, disastrous, it's happening to our planet right now - and we are to blame. As travellers, we're acutely aware that travel (particularly air travel) is sadly one of the largest contributors to global warming. But we also adore our planet and want to make sure that the places we've been fortunate enough to visit in our lifetime will continue to be there for our children and grandchildren as well. So how can we ensure that our adventure also preserves our home, and its awe-inspiring landscapes and intriguing cultures? It's all about attitude, and choice. From the food we eat, the products we buy, and the way we travel, the little choices we make every day add up to a huge difference in our world. Here are some of the ways you can make every day Earth Day when you travel. Travel is a huge purchase, and chances are unless you’re buying a house or car, it’s the largest one you’re going to make this year. You wouldn’t buy from a company that exploits people or places (hopefully), so why should your travels be any different? Do your research, and choose a travel brand that reflects your values and beliefs: do they care about the communities they visit? Protecting our planet as they travel? Do they condone cruel practices like elephant rides or lion walks? Do they give back to local communities? And more importantly – do they actually live by these values or are they just words on a page? 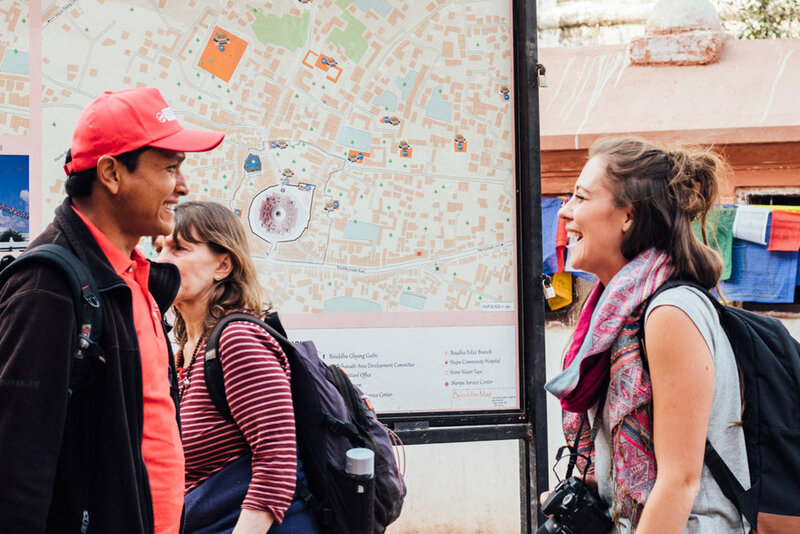 Personally, we choose Intrepid Travel, because in our view they do this better than anyone else, and we admire the way they live and breathe sustainable travel. Please, just stop. For a start, it’s illogical: in most developed countries we have clean, fresh, free drinking water available straight from our taps – yet we insist on buying bottled water that is more than 300 times the price. Would you pay 300 times extra for a meal, or a bus ride, or that new pair of jeans? For every one 1-litre bottle of water produced = we need another 2 litres of water + 200mL of oil. That means, in times of severe water scarcity around the planet, we’re using up to 3 times the amount of water. How’s that for inefficiency? Then there are the millions of litres of oil required to run processing plants and transport bottles to stores, and it’s all starting to add up to a huge resource drain. Given that only 1 in 5 of those bottles will actually be recycled and it takes up to 700 years for plastic to begin decomposing (not finish), that’s an awful lot of plastic choking up our environment. The solution? Switch to a reusable water canteen or drink bottle instead, and bring some water purification tablets with you when you travel. Your water will stay cooler, and you can enjoy the feeling of making a world of difference. Picture this: you’re enjoying a fun night out at a cool beachside bar in Cambodia. The conversation is flowing, as are the cocktails; each arriving with two little straws to make it easier for you to drink without bumping your teeth on ice or fruit while you dance and chat. You have one drink, then another, or maybe five… every one served with a new straw or two. By the end of the night, those five drinks have probably cost 10 straws – each used once before being thrown straight into the bin (or on the floor). Switch from loads of single-use plastic to this 12-pack of Bambaw straws (handmade in Bali and comes with their own cleaner too), or this gorgeous pack of 4 printed metal straws instead. When we first arrived in the UK, we were shocked by how much unnecessary plastic packaging is used everywhere. At Tesco, tomatoes come wrapped in plastic, you can buy 12 packs of chicken fillets that are individually wrapped, then wrapped in a plastic bag, and avocados (which have their own protective skin) come into twos… you guessed it, wrapped in plastic. In other parts of the world, little plastic bags and Styrofoam containers are used for everything from serving food and drinks at food stalls to pretty much any other use you can think of. 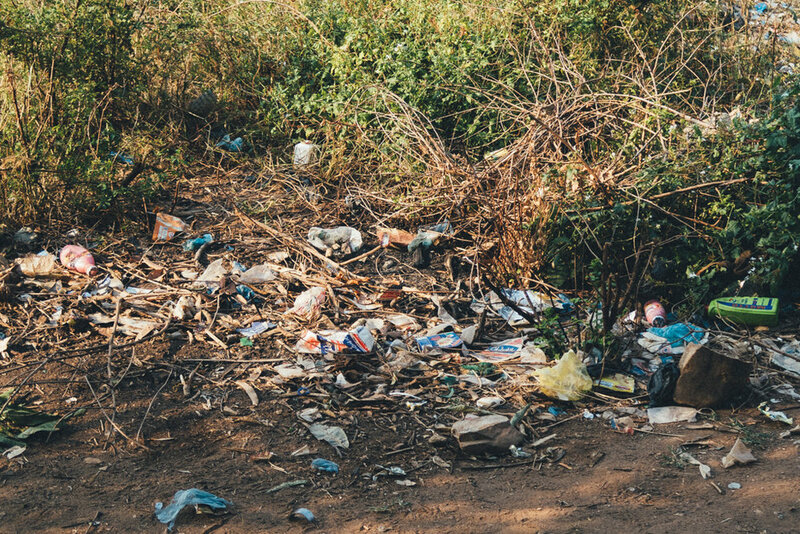 Just little bottles, plastic bags are non-biodegradable, and you only need to travel through developing countries to understand how out of control the littering of plastic bags has become. While many are introducing new policies (Kenya and Uganda have now banned all plastic bags, while the UK charges 5p per bag), the majority ends up in our oceans - just google the Great Pacific Garbage Patch. Until we live in a plastic-free society, pack a few lightweight canvas bags, shop at local markets rather than big supermarkets, and wave a big fat ‘bye Felicia’ to the plastic bags in your life. Along with the simple stuff like water canisters and canvas bags, the choices you make about the way you travel can have a huge impact on the health of the planet too. Sadly, between air travel, large hotel chains, and private transport, the travel industry tends to be a pretty big spender when it comes to carbon emissions - the largest contributor to global warming. But you don’t have to cancel all travel plans and stay at home forever. By choosing to sleep, eat, and travel like a local you can drastically reduce your carbon footprint and help to keep our planet’s lungs clean and healthy for centuries to come. Stay in locally owned guesthouses instead of large energy-intensive hotels, take local transport instead of hiring a private car, and buy from local markets and food stalls which cut down on emissions produced by food transport. Plus, your hard earned dollars will go straight to supporting the local communities you’re in, rather than going straight to the pockets of large corporations and you have a more authentic experience too. Win, win! Travelling with a brand? Choose one that is carbon neutral. We’re all about taking the path less travelled, and exploring pristine wilderness – but trampling a delicate ecosystem is a totally different thing. Did you know that a single wrong step of the boot can take the local flora years to regenerate? It literally expands the impact of your footprint. Whether you’re hiking, exploring desert landscapes, or wandering along a coastline, stick to the trails and leave no trace behind. Of the land that isn’t covered by ice, livestock takes up 30% of our land. By 2050, it's estimated that the emissions from the agriculture and food production industry will account for about half of the total available "carbon budget"
One billion people go hungry every day, and yet livestock now consumes the majority of the world's crops. Stats like that are horribly depressing, but the good news is, simply cutting back on the amount of meat you eat makes a huge difference. On our travels last year, we actually witnessed huge tracts of forest land that had been cleared for animal grazing or crop farming for the livestock industry. It was pretty heartbreaking to see the impact of this so directly, and at the end of our travel we decided that the meat industry was no longer something we wanted to support. We now eat a 95% vegetarian diet and allow ourselves a treat (generally chicken) every few months or so. If every single person on the planet cut meat from their diet a couple of times a week, we’d save the equivalent of 7 million cars on the road. Massive, right? Alright, this isn’t exactly how to help our planet in times of climate change, but while we’re on the topic of caring for our planet this is a big one. Please, please stop riding elephants, going on lion walks, taking photos with drugged up tigers, and visiting zoos. 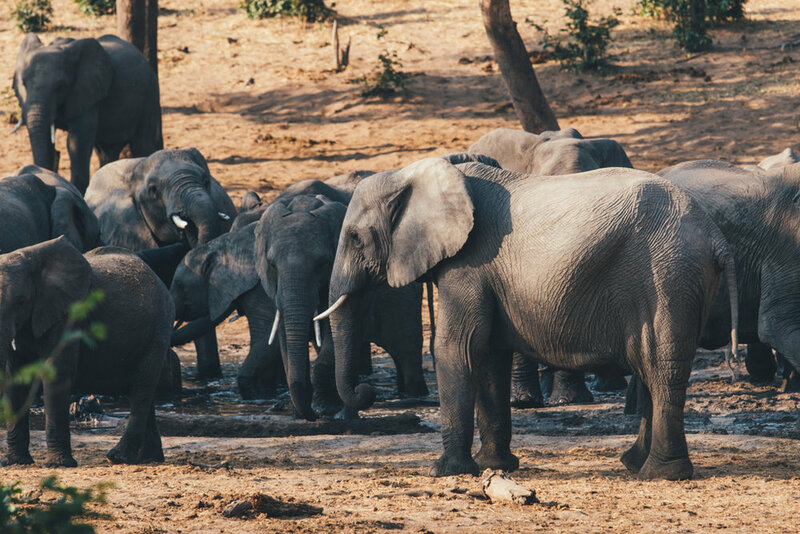 Simply put: elephants are cruelly tortured during their training, no lion or tiger would placidly lie around next to hordes of tourists snapping photos, and no animal should have to perform for a human, ever. Remember the Tiger Temple in Thailand? The one where you could snap photos next to tigers, and it was ok ‘because they were looked after by caring monks’? Turns out it was one of the worst of the biggest offenders when it comes to animal abuse, speed breeding, and corruption. No animal attraction is a good attraction. Think we've missed something? Share your tips on how to be a responsible, caring traveller below! WANT TO BE A MORE RESPONSIBLE TRAVELLER? THESE ARE THE POSTS FOR YOU!